In today’s generation we are faced with great technological advances. Most of the people today are greatly attached with gadgets and electronic devices in their daily lives causing a great risk of having incorrect vision. Aside from the gadgets that are being used everyday people can acquire incorrect vision through their genes. As a result, in order to correct your vision you must have your eye checked and use glasses. A lot would complain that wearing glasses is not that aesthetically pleasing and the corrective laser therapy is much too expensive, here is where contact lenses come in the picture. Wearing contact lenses allows you to move around like having normal vision without the hassle of using glasses. Using contact lenses does not alter the physical appearance of the person making you see clearly and look natural without the specs. Contact lenses are totally not that visible and more comfortable you will forget that you are wearing one. It also allows the user free eye movement especially in your peripheral view, which you cannot achieve when using glasses. 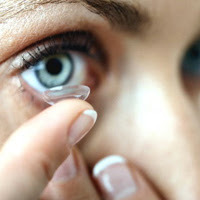 Contact lenses provide outmost convenience to the user. It gives great advantages for people who are in the sports industry enabling them to play a normal game without the hassle of glasses. People in working in a more humid condition can also benefit from wearing contact lenses instead of specs. The same is true for coloured contact lenses that are fast becoming the trend nowadays. Contact lenses do not change position when one is moving; it is stable therefore giving you the liberty to have correct vision with no disruptions. When there is heat or exposed in a cold temperature the contact lenses are not affected by the steam given off by the heat and the fog created by the cool temperature. There is a great variety when it comes to contact lenses. Other people may opt to use the clear and normal looking ones but there are also colored contact lenses that ranges from blue, green, violet, brown, black, grey and hazel. A lot of people usually use colored contact lenses even if they have perfect vision just for vanity purposes. If you are more experimental there are a lot of fancy contact lenses available in the market, the designs range from smileys, dragon eyes, tiger-eyes, chrome, alchemist, etc. Contact lenses are also used in movie production, wherein we could see it evidently in the movies that we watch like Darth Vader in Star Wars, The Crow, different Zombie films, Storm in X-Men, The Volturi in Twilight, etc. One popular artist that wears fashionable contact lenses is Marilyn Manson, having a glimpse of his pictures can give you the chills wherein he wears an out of this world style of contact lenses making his persona much more evident. Contact lenses are not only for those who have incorrect vision but also for people who want to express themselves, enhance their physical appearance or maybe also to support the character that they want to portray. It is such a joy having different functionalities with regards to the use of contact lenses. Peter Cruz is a writer on health and lifestyle and spends most of his time researching on related topics. During his free time, Peter is willing to share his insights and knowledge on health care to people through his articles.